I’ve come across several of the 11 unique snake species known as sand boas, and have had the good fortune of working with breeding groups of an Asian and African species. Following are some remarks drawn from my notes and conversations with colleagues. The Indian sand boa (2 possible subspecies) ranges widely through India and Pakistan. Those I have kept have reproduced without a winter cooling period (this likely varies among the various populations). 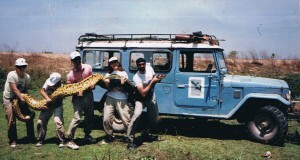 It is a good deal larger than the more popularly kept Kenyan sand boa, sometimes reaching 40 inches in length. Unfortunately, this impressive burrower is not commonly kept in the USA. Males in breeding condition go off feed and actively search for females. During courtship, the male attempts to unearth the female’s tail (she is generally below the sand when found) with his head. His spurs stand out slightly from the body and are rubbed along the female’s back. Copulation seems a quite awkward affair, with the male burrowing below the female and flipping more or less unto his back. The young are born alive after a 4 month gestation period. They are larger than those of related species, averaging 10-11.5 inches in length. A bit of umbilical cord usually remains attached for a few days, after which time it dries up and falls off. The young shed within 2 weeks of being born, after which most accept pink mice. In common with other members of the genus, young Indian sand boas likely prey heavily upon small lizards in the wild. “Scenting” pinkies with a lizard may encourage reluctant feeders. 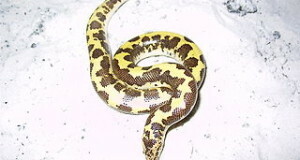 The East African sand boa is frequently classified as two separate subspecies, the Egyptian and Kenyan, with the Kenyan being the more brightly colored race. However, taxonomists disagree on this point, with some considering the entire species’ name invalid (please see reference below). Their reproductive mode parallels that of the Indian sand boa, but breeding is more likely if they are subjected to a winter cooling period (70F ambient, with a warmer basking site and a drop in temperature to 65F at night). Mating usually takes place in June-August, and the young, 4-18 in number, are born in October-December. They are 5-8 inches in length at birth, and reach sexual maturity at approximately 2 years of age (at which time they are approximately 16 inches long). Hi iam a wildlife photographer from india and would like to know details regarding the snake eryxcolubrinus.I would like to know where its forund in large numbers in india.Expecting your reply at the earliest. Hi iam a wildlife photographer from india and would like to know details regarding the snake which has its scientific name eryxcolubrinus.I would like to know where its forund in large numbers in india.Expecting your reply at the earliest. E. colubrinus does not occur in India. The sand boa species native to India is E. johnni and E. whitakeri. Perhaps it is one of these which you are interested in? I do not have any personal experience with either of those species in India, and range maps vary as where they are most common. Rhom Whittaker (for whom 1 species is named) would be the best source of information as to where they might be found. I’d be interested to hear what you learn…please keep me posted. Thank you for your information its very helpful. Sincerely, a Sand Boa owner. Hi iam from india and would like to know details regarding the boasnake .I would like to know where its forund in large numbers in india.Expecting your reply at the earliest. Hello Adarsh, Frank Indiviglio here. Thanks for your interest in our blog. I apologize for the long delay in responding to you…an emergency surgery put me out of commission for a time. E. colubrinus does not occur in India. The sand boa species native to India are E. johnni and E. whitakeri. I do not have any personal experience with either of those species in India, and range maps vary as where they are most common, depending, I’m sure, upon the ingenuity of various field researchers in finding them (they rarely appear above ground). Rhom Whittaker (for whom 1 species is named) would be the best source of information as to where they might be found. Hello Satish, Frank Indiviglio here. Thanks for your interest in our blog. You raise a very interesting question. Actually, a surprising number of the world’s 2,900+ snake species, including sand boas (and all boas and anacondas) give birth to live young. Ovoviviparous (live bearing) species are also common among the New World Viperids (rattlesnakes and their relatives), Australian Elapids (cobra relatives) and sea snakes. Snakes inhabiting the far north (European viper), where egg incubation via sun would be difficult, and highly aquatic species (tentacled snake), which would be at risk of predation when leaving the water, often bear live young as well. In certain snakes a simple placental connection, resembling in some ways that of mammals, has been identified. One species, the Brahminy blind snake (Rhamphotyphlops braminus) produces live young via parthenogenesis…all individuals of the species are female. how do you tell a boy form a girl? Hello Jose, Frank Indiviglio here. Thanks for your interest in our blog. The spurs (next to the cloaca) of adult male sand boas are larger than those of the female, although the difference may be slight. Also, when the snake is viewed from below, the tail of the male tapers gradually below the cloaca; because the hemipenes are housed within the body just below the cloaca, the tail is thick at that point. In females, the tail tapers very quickly (becomes narrow very quickly) below the cloaca. Probes can also be used to test for the presence of hemipenes, but I do not suggest doing this without experienced help. 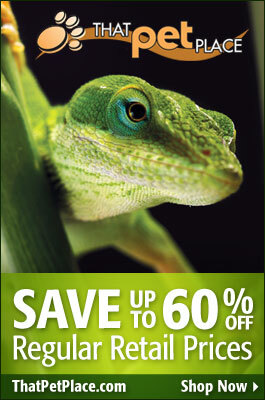 Is it true that multiple snakes of the species can be housed together without problem?